Before we go into a full-fledged regularity theory for Brakke flows, it is certainly reasonable to consider a simpler time-independent situation. Suppose that we have a varifold V ∈Vk(U) which happens to be a time-independent Brakke flow as we defined in Sect. 2.2. This should mean that the normal velocity v is 0 and that v = h implies h = 0, which means that V is stationary. 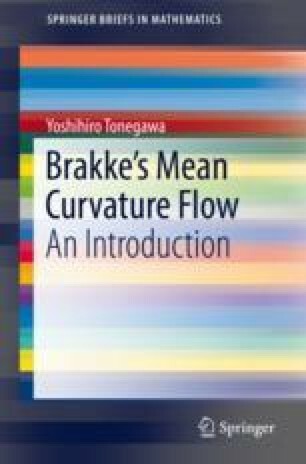 Let us adhere to the definition of the Brakke flow as in Definition 2.2 and check if this is indeed the case.